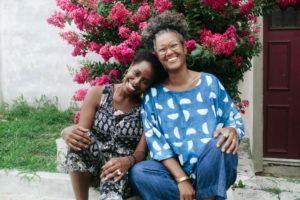 As ABOG Fellows, Khaliah D. Pitts and Shivon Love will create Our Mothers’ Kitchens, an invitation from the two artists for people of color to reclaim the stories of their past, adding to the collective narrative of the black woman’s experience through writings, recipes, and meals prepared and shared together. Over four collective dinners honoring writers Vertamae Smart-Grosvenor, Ntozake Shange, Zora Neale Hurston, and Alice Walker, the artists will create a space in which participants can connect to a lineage of literature and food from the African diaspora, reclaiming and affirming cultural influences and celebrating ancestry and memory. Shivon Love is a community educator and African diasporic foodways researcher. Her artistic practice centers the culinary, agricultural and cultural contributions of black people across the African diaspora. 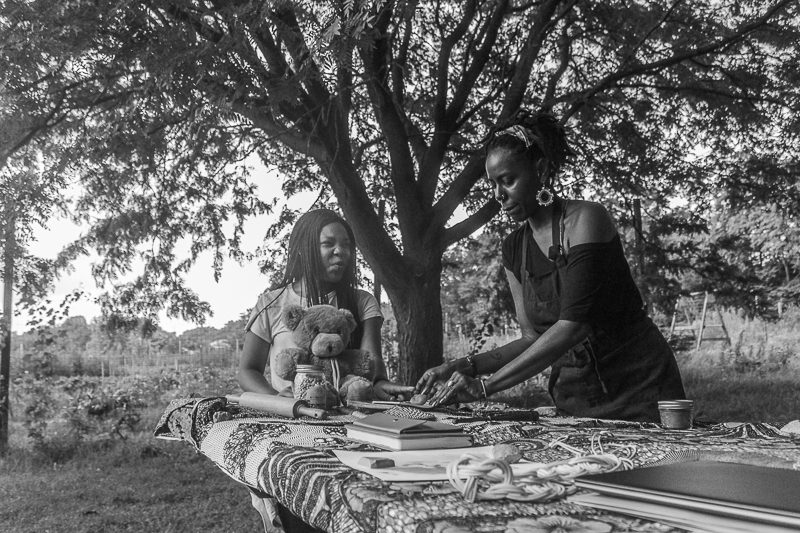 Primarily focusing on cultural preservation through storytelling, Shivon co-created and co-directs Our Mothers’ Kitchens, a Culinary and Literature program for Black girls with Khaliah D. Pitts. 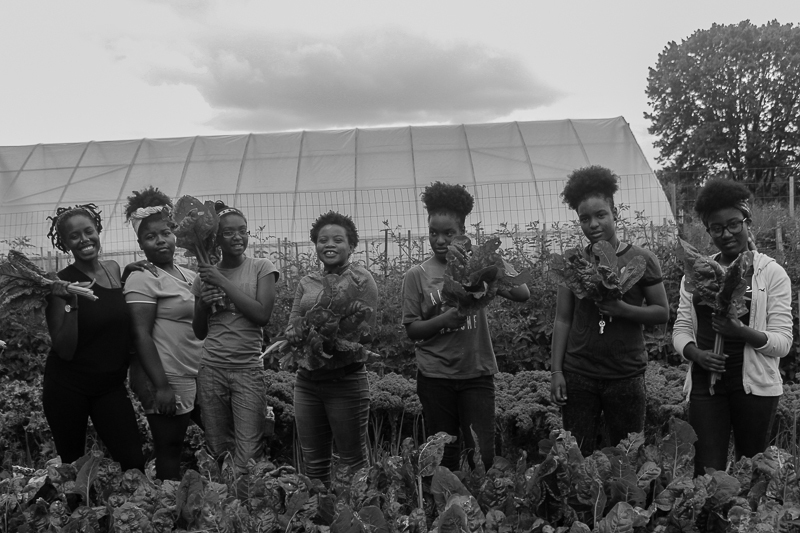 The project was supported by the Leeway Foundation and Sankofa Community Farm. As a collaborator in the Philadelphia Assembled project, Shivon co-curated the Philadelphia Assembled Kitchen, a 3-month long communal dining atmosphere at the Philadelphia Museum of Art. khaliah d. pitts is a Philly native and a lifelong artist. A writer and food educator, she dedicates her work to telling the stories of the African diaspora and always striving for liberation. In 2017, she worked as a culinary artist and collaborator of the Philadelphia Assembled Kitchen, a 3-month long communal dining experience at the Philadelphia Museum of Art, where she also edited and compiled the project’s publication From Our Kitchens: Recipes from the Philadelphia Assembled Kitchen. 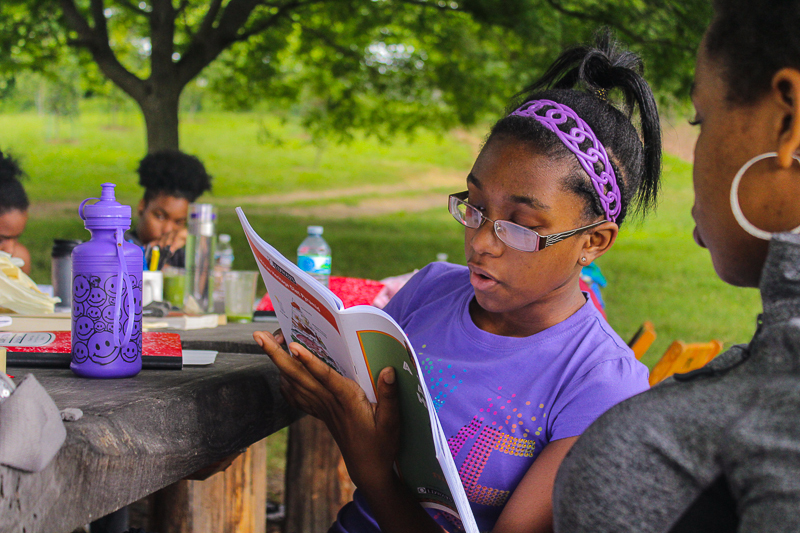 Khaliah co-created Our Mothers’ Kitchens Culinary + Literature project for Black girls with her sister-friend, Shivon Love. 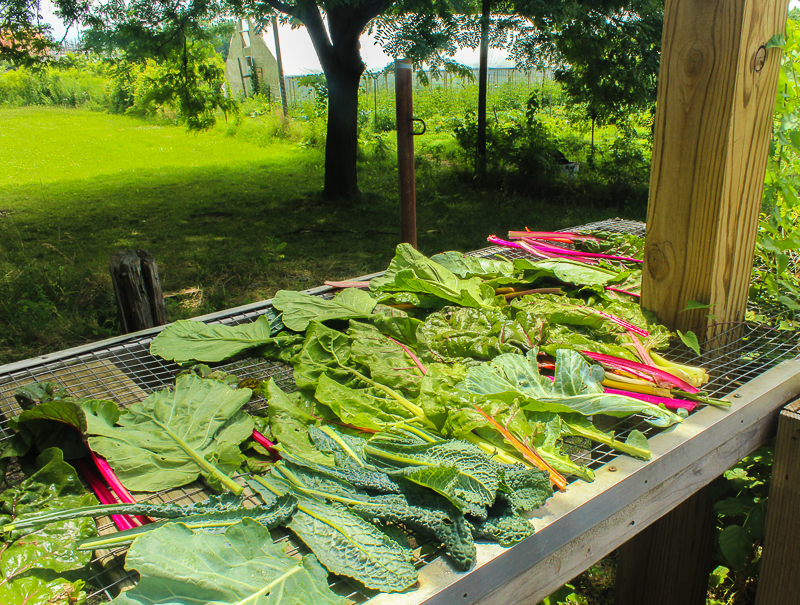 Chard, collards and kale harvested, washed and bathing in the sun. Photo: Gabrielle Clark. 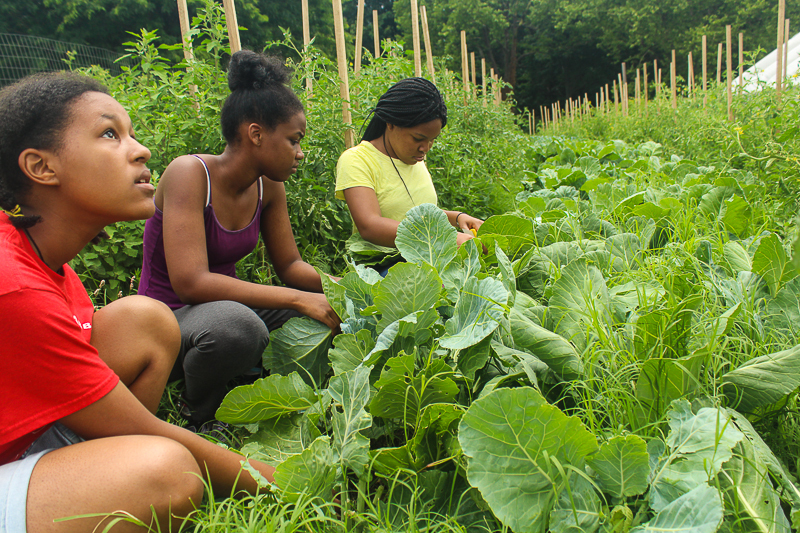 Harvesting greens for lunch on Sankofa Community Farm for Our Mothers’ Kitchens Camp, 2017. Photo: Gabrielle Clark. 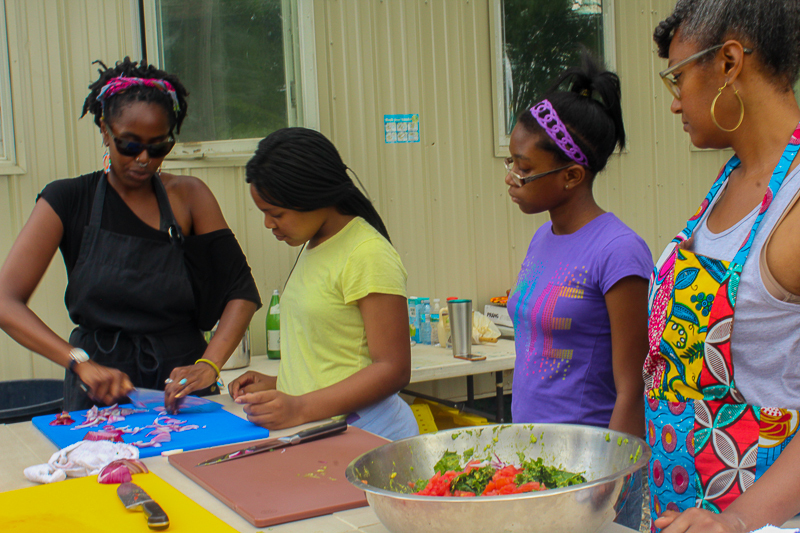 Learning knife skills by de-ribbing collards at Our Mothers’ Kitchens Camp, 2017. Photo: Gabrielle Clark. Reviewing knife skills, Our Mothers’ Kitchens Camp, 2017. Photo: Gabrielle Clark. 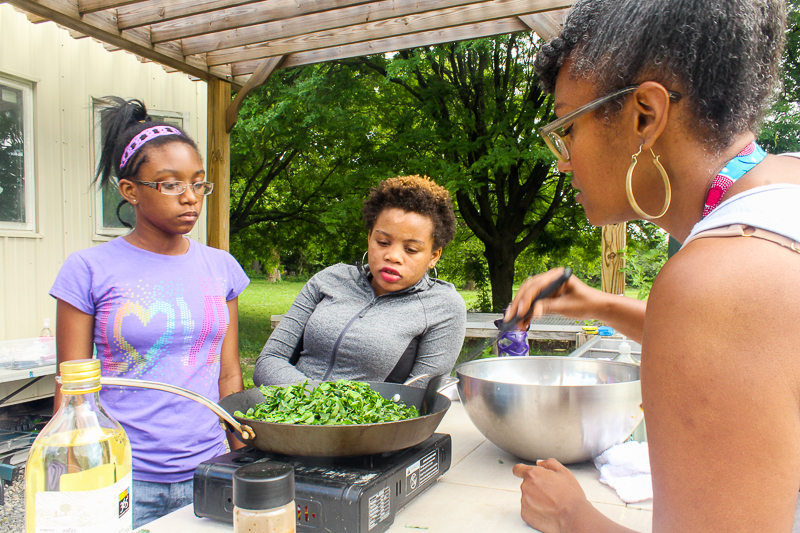 Seasoning and sautéing collards, Our Mothers’ Kitchens Camp, 2017. Photo: Gabrielle Clark. 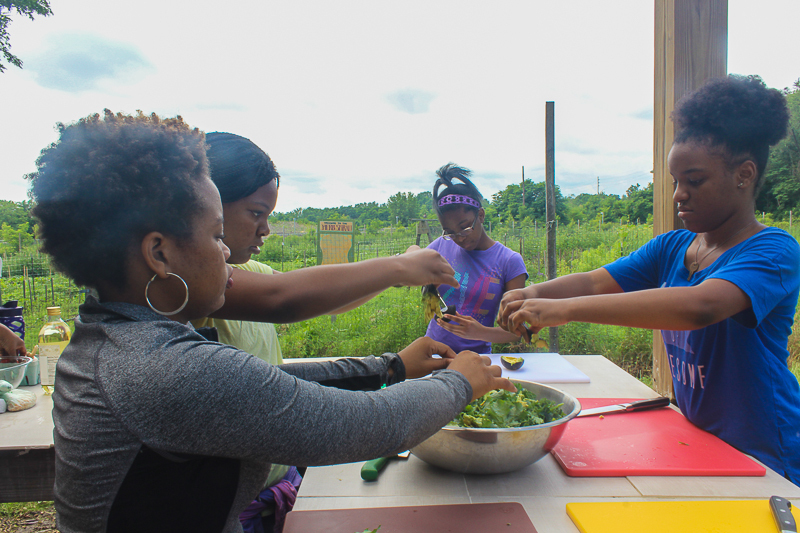 Prepping a farm fresh kale salad, Our Mothers’ Kitchens Camp, 2017. Photo: Gabrielle Clark. 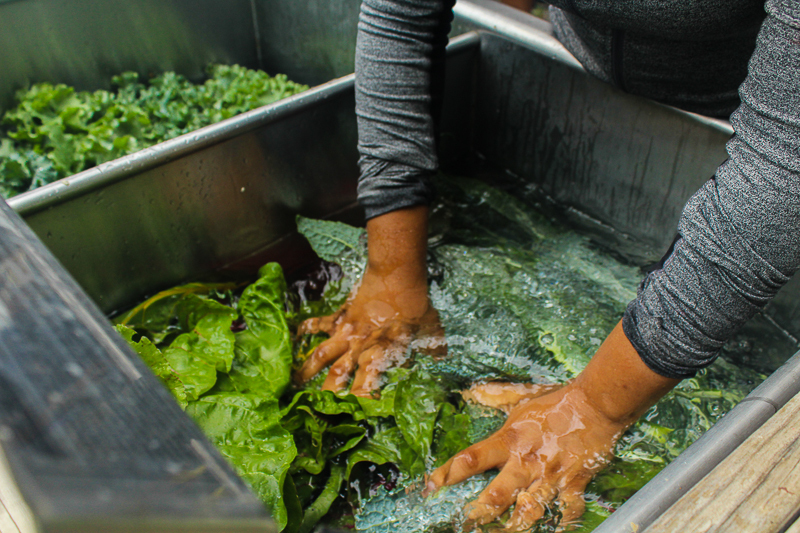 Washing greens, Our Mothers’ Kitchens Camp, 2017. Photo: Gabrielle Clark. Creating a kitchen altar, Our Mothers’ Kitchens Camp, 2017. Photo: Gabrielle Clark. 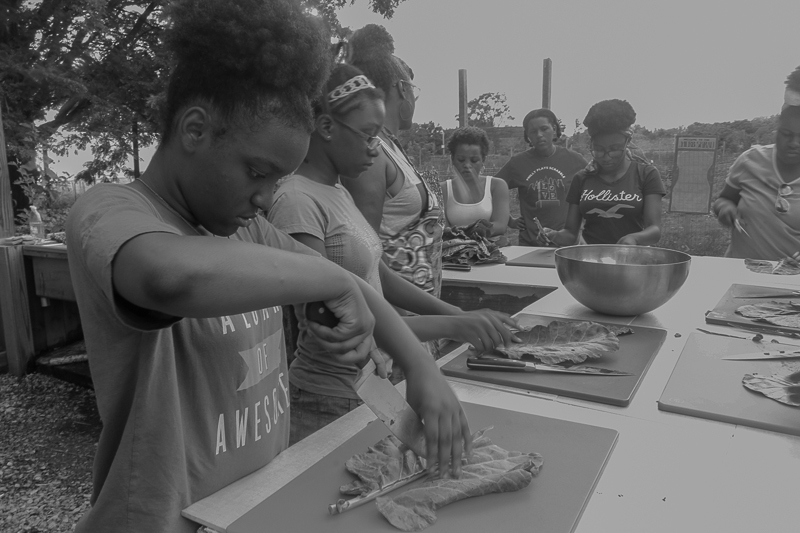 Our Mothers’ Kitchens Camp at Sankofa Community Farm in Southwest Philadelphia, 2017. Photo: Gabrielle Clark. Our Mothers’ Kitchens Camp, 2017. Photo: Gabrielle Clark.